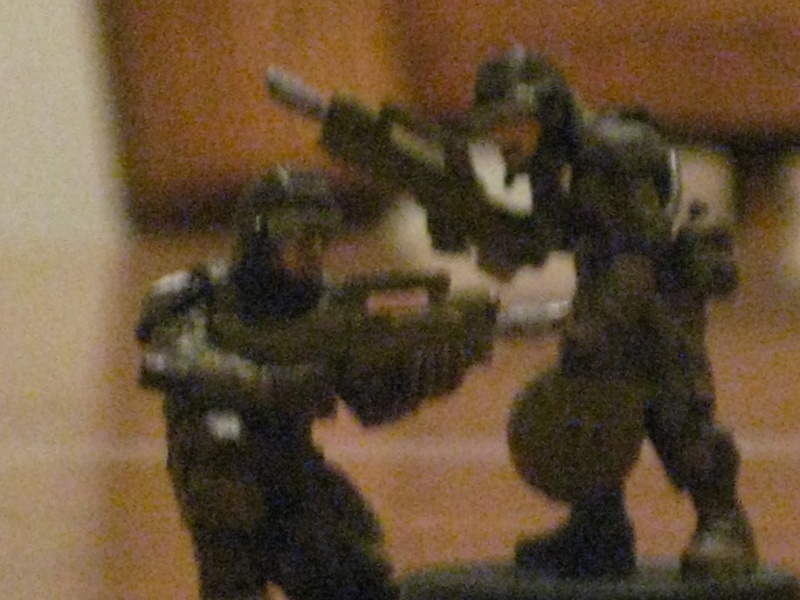 I thought I would use this thread to keep a status log on my Elysian Drop Troops army. 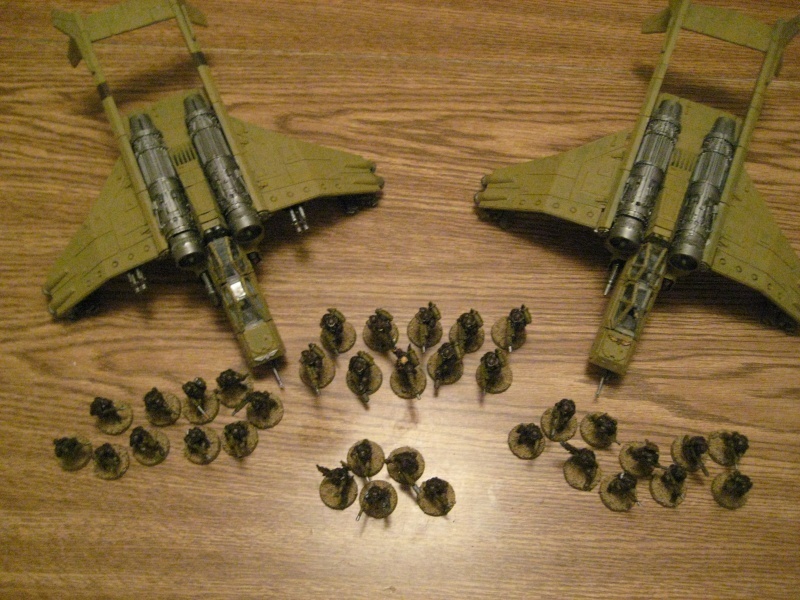 For anyone not in the know, Valkyries in the Imperial Guard army are essentially the same as the Black Hawks used by the US army. 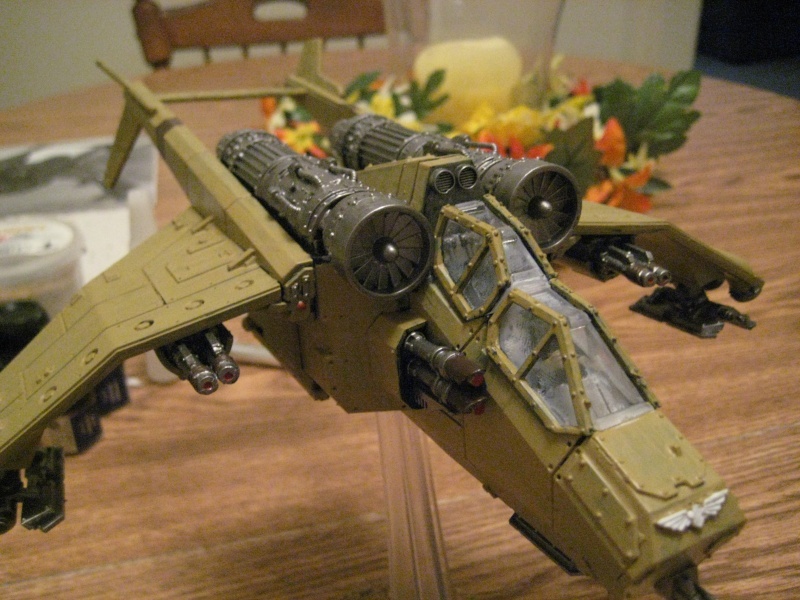 They are flying gunships that can transport troops. I haven't gone into the exact equipment for all of the above squads, but for the layouts I want to use, I think I will still have about 50 points to play around with. I have 6 squads and 5 transports. All of the transports are fast skimmers that have the scout special rule. Two of my squads can deep strike if I want to giving me the option to leave 1 transport empty (the Vendetta). This army gives me the ability to fight on my own terms, where and when I want to. If I go first, I can deploy everything, take a 24" scout move before turn 1 starts and drop a world of hurt off on turn 1 in my opponents face. If my opponent steals the initiative, I can still scout 24" to get a 3+ invuln save for my Valk's (fast skimmer rule). If my opponent goes first, I can keep everything in reserve. All of the transports can make an outflanking move and I have two squads deep striking. The Storm Troopers can reroll their scatter for deep striking rolls and the Astropath gives me +1 to reserve rolls and lets me reroll which side of the board my outflanking units come in on. This will help bring everyone in early and where I want them. It also lets my relatively vulnerable army get to strike first. One negative to this list is that all of my troop choices will get shot to hell if their transport gets shot down or if I disembark them at a poor location. If I lose Valkyrie's early in the game, it will also be a major set back. The squadron rules also mean that I will be limited in the number of targets I can shot at in a round. My Valkyrie squadrons are split up by roles. The multiple missle pod squadron is anti infantry. 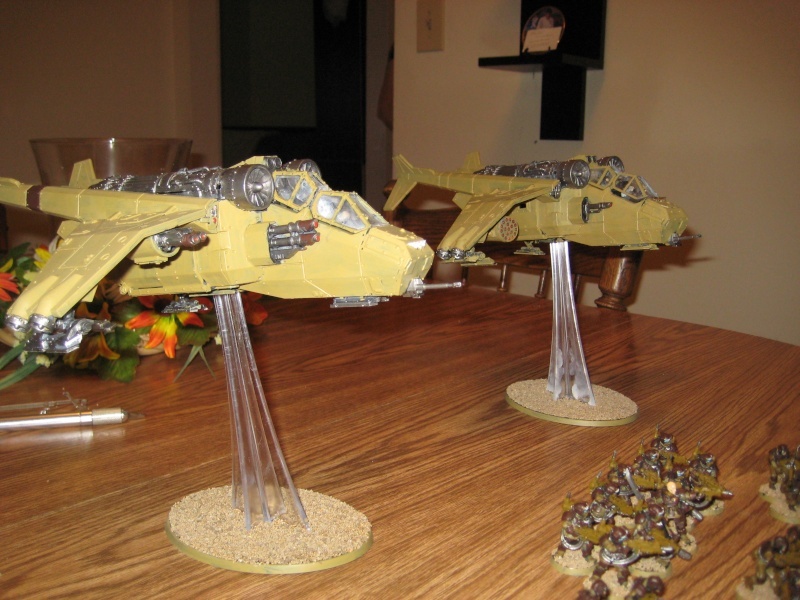 The two ships can move 12" and fire all of its weapons. That is a combined 6 multi-laser shots and 4 large blast markers from the multiple missle pods (str 4 ap 5, so they count as defensive). 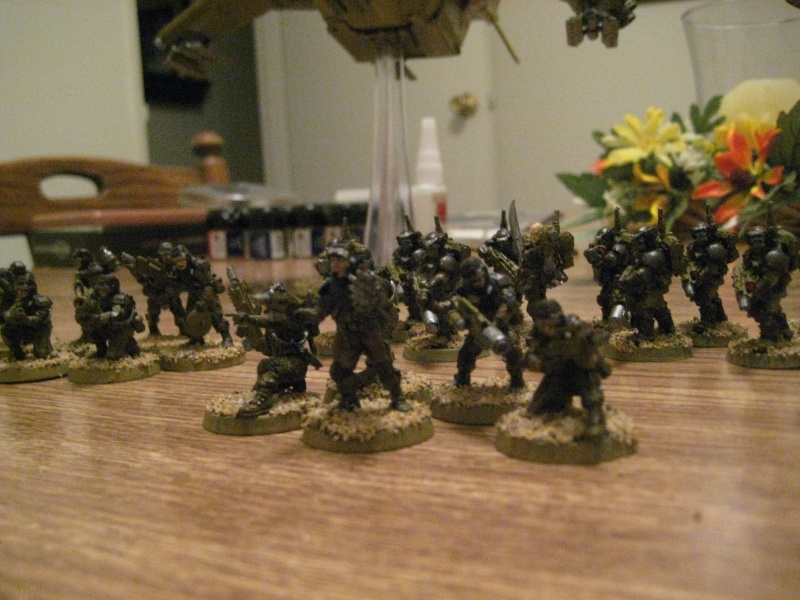 The other squad armed with a lascannon and 2 hellstrike missles on each is equiped for medium to light vehicles. The lone Vendetta is there to bust up the battle tanks and monstrous creatures with its 3 twin-linked lascannons. 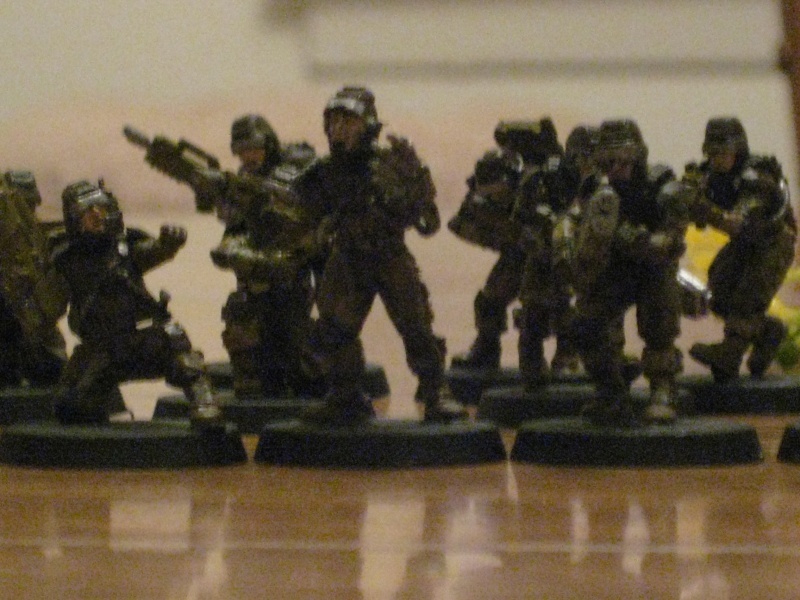 All of the Veteran squads are armed for specific tasks, but are fairly well-rounded. 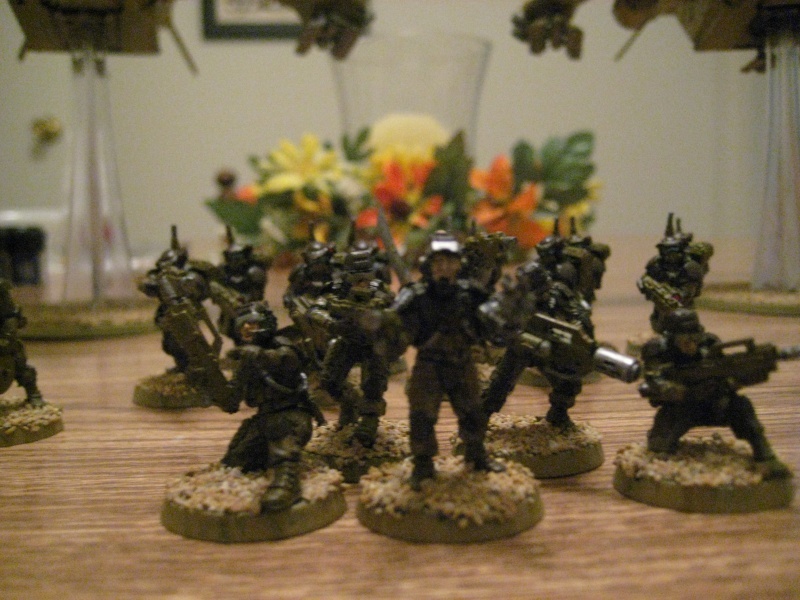 They all have the demolitions doctrine, so they are all armed with melta-bombs and a one time use demolition charge (6" range, str 8 ap2 large blast!). That alone gives them anti-any troop and anti-tank. 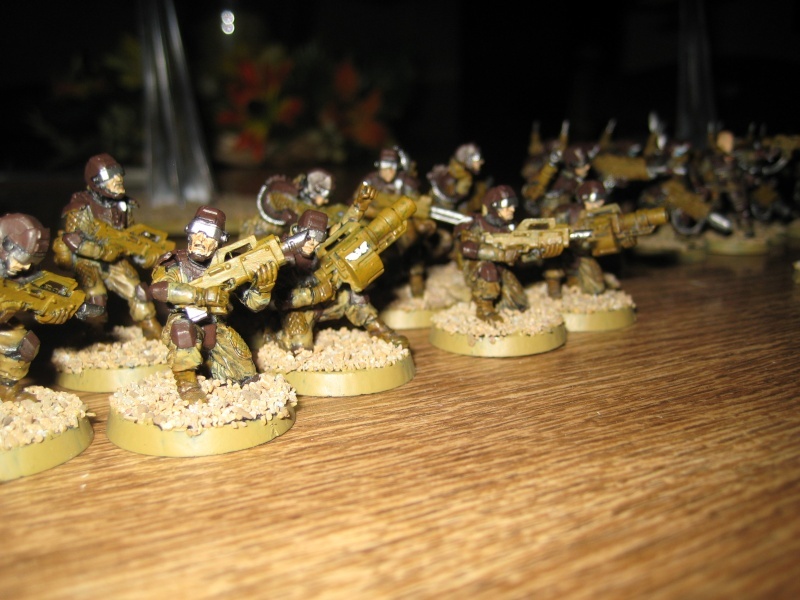 One squad will also be armed with 3 plasmaguns, another with 2 meltaguns and the third with 2 flamers. The third weapon for the last two will probably be a gernade launcher. This gives each added firepower and makes them a little more specialized. The command squad will most likely be in the same squadron as the plasma vet squad. This way they can disembark next to them and give them the order to make opponents reroll successful cover saves. That will help ensure maximum damage to any target in cover. The two Storm Trooper squads are in more of a suicidal role. It fits their Glory boy status. Since they can deepstrike (and reroll the scatter), they can strike anywhere. Their role is to hit tough targets hard. They are already armed with str 3 ap 3 hot-shot lasguns (aka Hellguns). 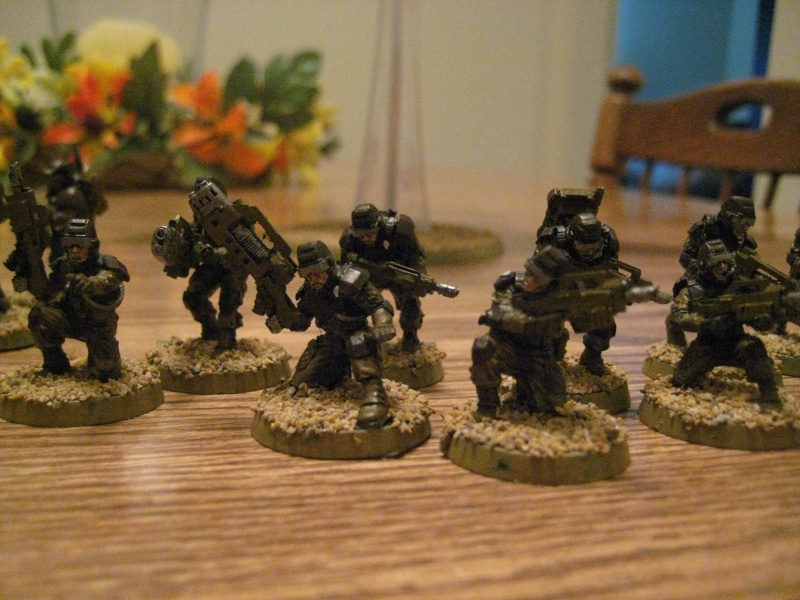 The one squad I know I want to give two meltaguns for additional anti-tank power. The other squad I am not sure how I want to equip yet. It may be 2 flamers or 2 plasmaguns, or a mix. It will definitely be fun to play. I think it will do ok in casual games. 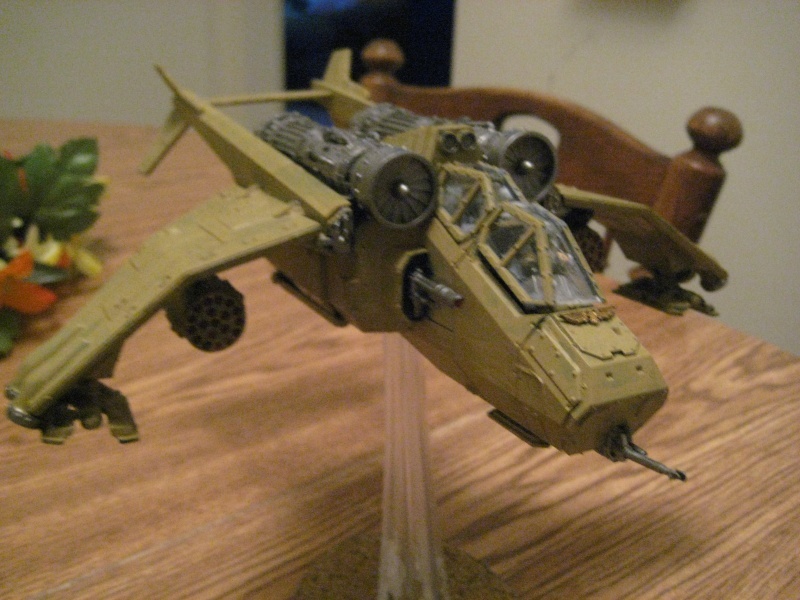 Below I have placed a few pics of the Elysians. They are the first models I have ever inked. They look amazing with the ink, but unfortunately the detail doesn't shop up in the pictures. I had trouble getting the camera to focus on them, so that may be the reason. 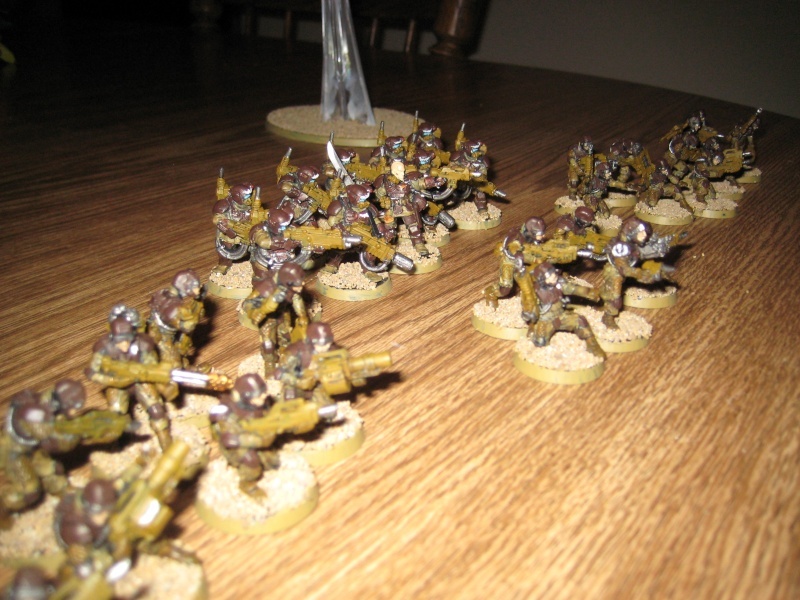 I plan on flocking their bases with sand for the complete desert look. Thought I would add an update. I am one Valkyrie purchase away from having the entire army. I'll add some pictures eventually. I will probably use the Storm Trooper squad for Kill Team missions. this is for apocalypse, or standard because after talking about it, god dammed that's a lot of guards. The list I have at the top is a 1500pt guard list. 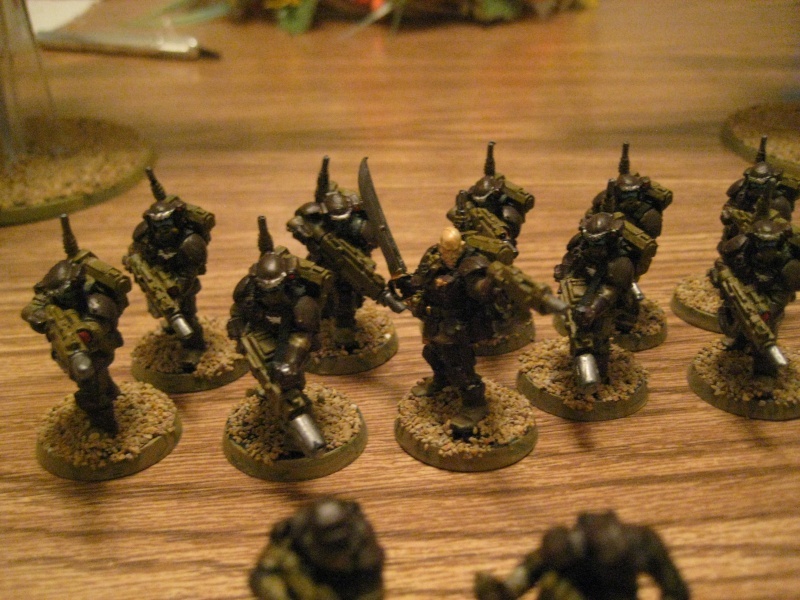 It has about 20 less guardsmen and the same number of vehicles as my other guard list that you have fought a few times already. You probably won't see them together in the same battle except for Apocalypse battles. 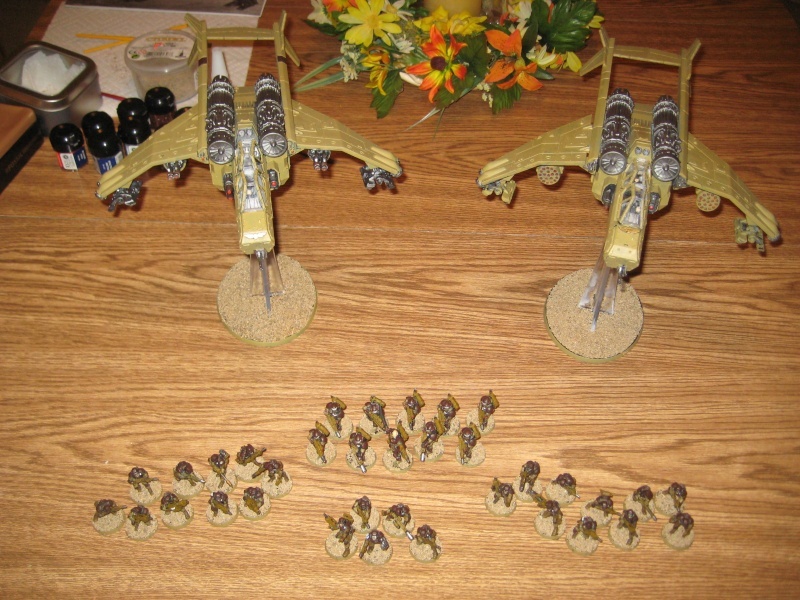 If we ever did play a GI-NORMOUS apocalypse battle, I would field all of my Imperial forces as one. The only thing I am missing below are some Titans. This is a Blitzkrieg force! Air support and lots of tanks and troops on the ground. Going to need a lot more bugs to hold those crazy guys off. Dammed armor penetrating is the hard part lol. Progress update! I went a little crazy with the pictures, but here they are! 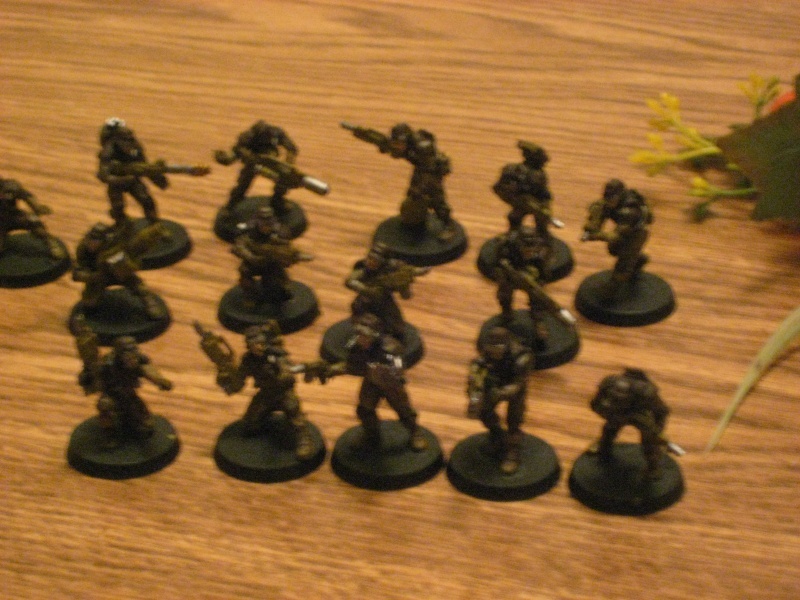 The two finished valkyries, 2 10 man Drop Troop Veteran squads, Command Squad and Storm Trooper Squad. Updating the status. 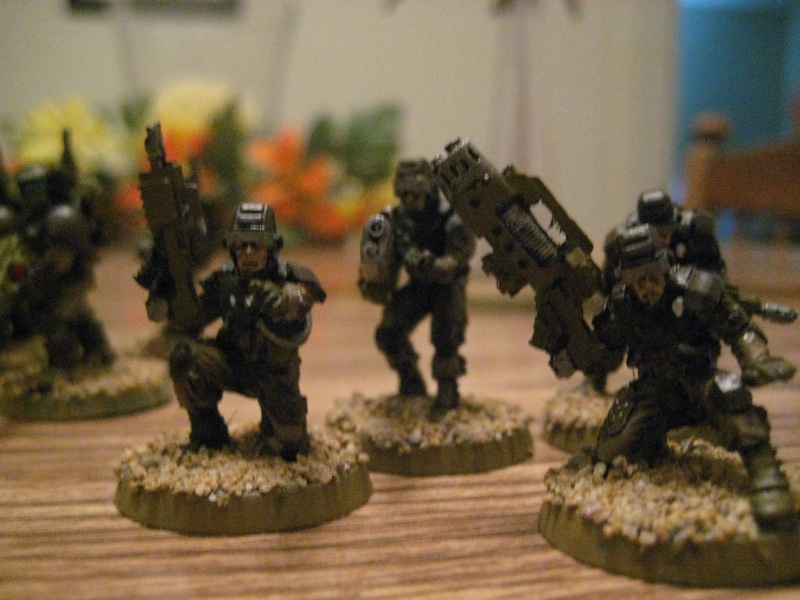 Just finished painting and basing the 2nd storm trooper squad. Repainted all of the plasmaguns with twilight blue, some ink and white highlights so they look like the glowing plasmaguns in the Dawn of War games. 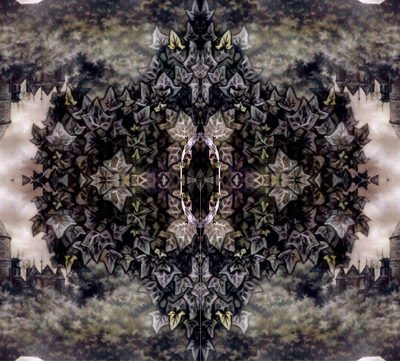 Only two valkyries left.